**Add our site now, it's an easy way to bookmark us for later use. Using our interview thank you letter sample stresses fit is a great format for showing the employer your skills fit the job they have open. Possibly you have heard a thank you letter is really not that important!! Or that employers don't really look them over!! Well, don't you even believe a single word!! 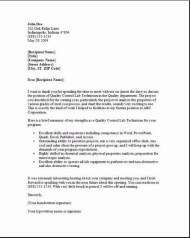 This thank you letter shows you are fit for the job after the interview by pointing out and recapping the companies requirements with you matching your talents specifically to the job they have open!! 1. Highlight your best fit skills, your experience without repeating something already stated in your resume. 2. Indicate you understand this position and by your research of their organization, show your enthusiasm for what the company is all about. 3. Demonstrate that you think your candidate skills are perfect for the position – go ahead and brag just enough to show your interest, you know that your competition will also do this, so don't hesitate. 4. Stimulate interest by convincing the interviewer in your thank you letter you are passionate about the position and are confident in your abilities to fulfill their needs with little training. 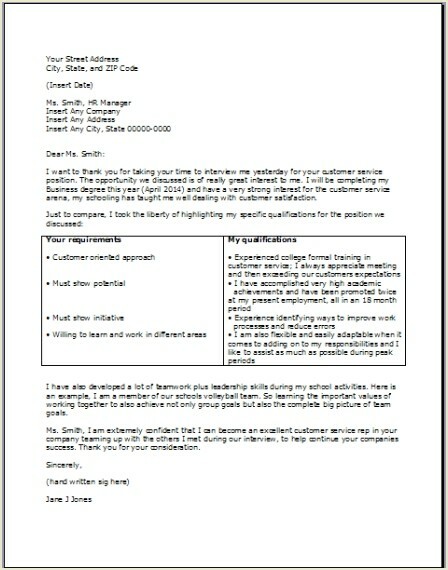 Your best fit Thank you letter should look similar to the example below. 1. Just copy then paste into a word document!! Or download it from the above link!! I want to thank you for taking your time to interview me yesterday for your customer service position. The opportunity we discussed is of really great interest to me. I will be completing my Business degree this year (April 2014) and have a very strong interest for the customer service arena, my schooling has taught me well dealing with customer satisfaction. I have also developed a lot of teamwork plus leadership skills during my school activities. Here is an example, I am a member of our schools volleyball team. So learning the important values of working together to also achieve not only group goals but also the complete big picture of team goals. Ms. Smith, I am extremely confident that I can become an excellent customer service rep in your company teaming up with the others I met during our interview, to help continue your companies success. Thank you for your consideration.